A creative word game about associations. One player chooses a topic and each player picks one of the 4 attribute cards from their hand. If they have a green sheep, they must try the attribute that matches the topic best. If they have a red sheep they try to pick an attribute that least matches the topic. Then everyone tries to grab the attribute that comes with a green sheep. It's a flurry of fun and action as players try to grab the matches. 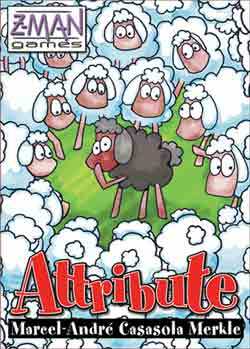 Attribute is a fast and load party game in some ways similar to Apples to Apples, but simply much better. The reason Attribute is such a good game is first and foremost that the categories that are used in the game are not pre-determined by the game, but are made up by the players themselves. This gives the game infinite replayability and at the same time ensures that the game is suitable for almost any group of people (the topics chosen by a group of adult friends varies significantly from those chosen by a family with small children).